This agreement states the terms and conditions that apply when you use Portage County Bank’s eBanking service. These terms and conditions are in addition to those that apply to any accounts you have with us or any other services you obtain from us. You can obtain copies of any disclosures pertaining to all of your Portage County Bank accounts by calling 715-341-8808. You must also follow all of our instructions and procedures applicable to the services covered by this agreement. The terms “you” and “your” mean each person who establishes an eBanking Customer Account with us or who uses or is authorized to use the eBanking User ID and password or other means of access we establish or approve. “Portage County Bank eBanking” means our service that allows you to make payments, transfer funds, access accounts, obtain information and perform other transactions over the Internet by use of a personal computer and modem and/or other means we authorize or allow. Should conflicting terms arise between the Portage County Bank eBanking disclosures and the original product account disclosures, the most recent version of the original product account disclosure will take precedence. Make transfers between your qualifying accounts to the extent authorized. Obtain information that we make available about your qualifying accounts. You must have enough available money or credit in any account from which you instruct us to make a payment or transfer. You may not designate any account that requires more than one signature for withdrawals as an account for use for payments or debits. If any of your qualifying accounts are money market savings accounts, certain types of withdrawals from those accounts are limited to a total of no more than 6 in any statement cycle (preauthorized, withdrawal, check paid, draft,debit card, automatic transfer, telephone transfer or payment out of the account). You also agree to the “Deposit Account Rules” that you received when you opened your deposit account. You can request another account disclosure at the time you fill out your Portage County Bank eBanking application. Through no fault of ours, the account has insufficient funds, has been closed, or is not in good standing. We reverse a payment or transfer because the account had insufficient funds. The payment or transfer would exceed the credit limit of the account. You have not given us complete, correct or current account numbers or other information required to complete the payment, credit, transfer or other transaction. Your equipment was not working properly when you attempted to conduct the transaction. Our equipment was not working properly when you attempted to conduct the transaction and it should have been apparent to you at that time. You do not properly follow our instructions, fail to provide accurate information or fail to promptly inform us of any inaccurate information about which you became aware. You do not request a stop payment within the time period set forth in this agreement and the payment is completed. The account balance is subject to legal process or other claims that restrict the payment, transfer, or other transaction from being completed. Circumstances beyond our control prevent, delay, intercept, alter or otherwise adversely affect the payment, credit, transfer, or other transaction. Our Portage County Bank eBanking service is generally available 24 hours a day, 7 days a week. However, we only process transactions and update information on business days. Our business days are Monday through Friday. Transfers made after 10:00 p.m. will generally be processed on the next business day. Holidays are not included. Your Portage County Bank eBanking payments and transfers will be indicated on the monthly or quarterly statements we provide or make accessible to you. You agree to notify us promptly if you change your address or if you believe there are any errors or unauthorized transactions on any statement, or statement information. You agree to the terms of this account and the schedule of charges that may be imposed. You authorize us to deduct these charges as accrued directly from the account balance. You are liable for all transactions that you or any you may authorize, even if the person you authorize exceeds your authority. If you have given someone your Portage County Bank eBanking user ID and password or other means of access and want to terminate that person’s authority, you must change your identification number and password or other means of access or take additional steps to prevent further access by such person. (a) Consumer Liability. (1) Notify us AT ONCE if you believe your user ID and/or password has been stolen or that an unauthorized transfer has occurred or may occur. Notifying us by telephone is the best way of keeping your losses down. It is possible to lose all of the money in your account as well as any overdraft line of credit. If you notify us within 2 business days after learning of the loss or theft of your user ID and/or password, you can lose no more than $50 if someone used your user ID and/or password without your permission. If you DO NOT notify us within 2 business days after you learn of the loss or theft of your user ID and/or password, and if we can prove we could have stopped someone from using your user ID and/or password without your permission if you had told us, you could lose as much as $500 or an unlimited amount depending on when the unauthorized transaction occurred, if someone used your user ID and/or password without your permission. Also, if your statement shows transfers that you did not make, notify us AT ONCE. If you do not notify us within 60 days after the statement was mailed to you at your last known address, you may be liable for the entire amount transferred after the 60 days if we could have taken action to reduce your loss with timely notice. If you delay in notifying us because of extenuating circumstances, we will allow an extension of time for a reasonable period. (b) Contact in event of unauthorized transfer. Telephone us AT ONCE at 715-341-8808 if you believe your user ID and/or password has been stolen or that an unauthorized transfer has occurred or may occur. By telephone is the best way to notify us. However, you may also notify us by mail at 5417 Vern Holmes Dr. Suite 1, Stevens Point, WI 54482 or by email to info@portagecountybank.com If you notify us in writing, include only your name, address, telephone number and a brief description of your problem. For security reasons, never include an account, social security, or user ID in your email. If we receive an email from you, we will send an email confirmation. In case of errors or questions about your transactions and electronic transfers, call or write us at the telephone number or address listed in this agreement, as soon as you can, if you think your statement or receipt is wrong or if you need more information about a transfer listed on the statement or receipt. We must hear from you no later than 60 days after we sent the FIRST statement on which the problem or error appeared. Describe the error or the transfer you are unsure about, and explain as clearly as you can why you believe it is an error or why you need more information. Tell us the dollar amount of the suspected error. We will determine whether an error occurred within 10 business days after we hear from you and will correct any error promptly. If we need more time, however, we may take up to 45 days, (90 days if the transfer involved a new account, a point-of-sale transaction, or a foreign-initiated transfer) to investigate your complaint or question. If we decide to do this, we will credit your account within 10 business days for the amount you think is in error,(for new accounts, we may take up to 20 business days to credit your account for the amount you think is an error) so that you will have the use of the money during the time it takes us to complete our investigation. If we ask you to put your complaint or question in writing and we do not receive it within 10 business days, we may not credit your account. If we decide that there was no error, we will send you a written explanation within 3 business days after we finish our investigation. You may ask for copies of the documents that we used in our investigation. There is no fee for the Portage County Bank eBanking basic service. We may charge you for each stop payment request. Please contact Portage County Bank for the current fee schedule. All transactions occur on a secure server, which uses numerous firewalls and encryption programs. At no time will you be requested to pass your Portage County Bank account numbers over the Internet. A user will automatically be logged out of the online connection after 10 minutes of inactivity. A user will automatically be locked out after three bad user ID/password attempts. A user will automatically be locked out of their eBanking account if the account has not been accessed for a sixty-day period. Portage Count Bank has the ability to monitor account usage and will monitor periodically for unusual activity. Portage County Bank will limit your access to only the accounts you own. No money can be transferred out of your Portage County Bank accounts. The customer is required to use a secure browser incorporating secure socket layer (SSL) encryption to establish a connection to the login screen. Presently, the system requires 128-bit encryption. Portage County Bank reserves the right to change this requirement at any time to maintain the security of our Portage County Bank eBanking products. Portage County Bank respects your privacy and does have a privacy statement. You can obtain a current copy by visiting our website: www.portagecountybank.com or by calling 715-341-8808 to request to have a copy sent to you. Portage County Bank reserves the right to terminate the Portage County Bank eBanking service at anytime, and for any reasons (ie: suspicious or fraudulent activity). This is to protect our customers and Portage County Bank from hackers or other malicious access. If you wish to cancel the Portage County Bank eBanking service, contact Portage County Bank at 715-341-8808. Portage County Bank staff can assist users with product support geared to the online product. Usage questions or concerns should be forwarded to Portage County Bank via email to info@portagecountybank.com or call 715-341-8808. Portage County Bank cannot assist online users with hardware, software or browser issues. Please contact the manufacturer or authorized dealer of the product in question. Refer to the materials in the product package at the time of purchase for contact numbers. A third party administrator may process one or more of the services. All disputes and controversies arising out of or in connection with this agreement or the breach thereof shall be submitted first to negotiation and, if not resolved by negotiation, then to mediation and, if not resolved by mediation,then to arbitration. All such negotiations and any mediation or arbitration proceedings shall involve persons having authority to settle all claims and shall be conducted promptly after written notice from either party requesting negotiations, mediation, or arbitration. An individual agreeable to all parties having expertise in the subject of the dispute shall preside over any mediation or arbitration proceeding. Any decision rendered by a mediator shall be advisory only and shall not be final or binding but any decision rendered by an arbitrator shall be final and binding and judgment upon the award rendered by the arbitrator may be entered in any court having jurisdiction thereof. All mediation and arbitration proceedings shall be conducted in accordance with the applicable rules of the American Arbitration Association. The parties shall each be responsible for and pay their respective costs, including attorneys’ fees, incurred by them in preparing and presenting their case at the mediation and arbitration proceedings but the costs of the mediator and arbitrator shall be shared equally by them. The agreement shall be binding upon and shall insure to the benefit of you, Portage County Bank and Portage County Bank’s successors and assigns. You may not assign your rights or responsibilities under this agreement. This agreement shall be governed by and construed according to the internal laws of the State of Wisconsin without regard to conflict of laws principles. Fewer types of available electronic funds transfers; or Stricter limitations on the frequency or dollar amount of transfers If we make such an immediate change permanent and notification will not jeopardize the security of an account or system, we will notify you in writing on or with the next regularly scheduled periodic statement or within 30 days of making the change permanent. You are required to inform Portage County Bank of any changes that occur regarding your e-mail address. 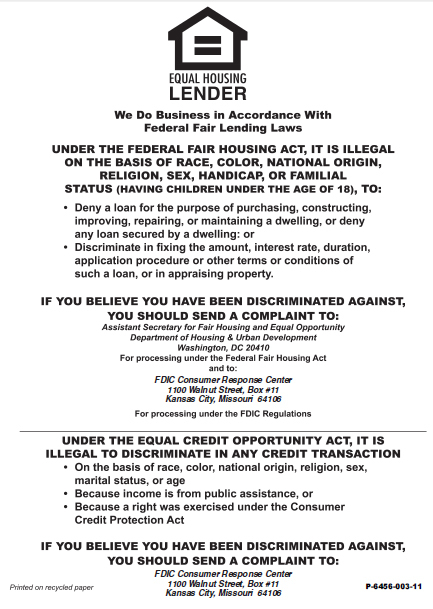 You may always obtain the most recent copy of this agreement by calling 715-341-8808 to request a copy be sent to you.